The stricken giant lay still and prone, towering overhead much like Gulliver must have appeared to the Lilliputians. 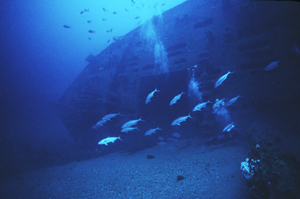 Her immense size, along with the fantastic visibility afforded us by the clear waters off Cape Hatteras, combined to form an overwhelming, deep-sea vista only imagined by less fortunate divers. A school of amberjack circled my rising bubbles curiously, hampering my efforts to capture the moment on film. "Get out of my way!" I thought, "I haven't much time here!" 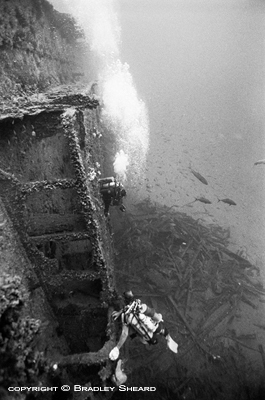 Standing on the sandy bottom beneath the ship's bow, I could clearly see the tiny silhouette of another diver high up on top of the wreck. Humbled, I felt priviledged to be a spectator to this fantastic scene beneath the sea—a living monument to the brave merchant sailors of the Second World War. For the past year the big tanker had haunted our dreams. We had been permitted only a fleeting glimpse of her majestic form twelve months earlier, but in that brief encounter she had captured our collective hearts. Lying barely outside the clutches of that mighty river in the Atlantic known as the Gulfstream, the water was an irridescent blue that seemed to glow with brilliance. Schools of amberjack darted across her hull effortlessly, largely undisturbed by our presence, perhaps knowing that we were only visitors and would soon be compelled to leave. 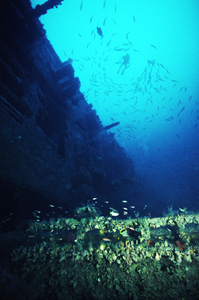 The sea had taken possesion of the E.M. Clark, and only a very few had dared to explore her challenging depths. She lay on her port side with her upper, starboard side rising to within 200 feet of the ocean's surface—the bottom lay deeper still, aluring, yet forbidding. We had chartered Captain Art Kirshner's dive boat Margie II once again to dive the wreck, but the stormy seas and unpredictable currents off Cape Hatteras made the entire venture all too uncertain. It had been a long winter for a thirsty group of divers—but all the planning and waiting seemed trivial now. This indeed was a magical moment in time and space, and I stood transfixed in awe, admiring the huge and majestic shipwreck looming above me. Directly beneath her intact bow the sandy bottom dropped away steeply into a huge, crater-like depression, sculpted away by the relentless ocean currents. In the center a small mound of anchor chain rose up from the bottom to form a blunted stalagmite, completing the illusion of a lunar crater. Indeed, this seemed as alien a world as the mountains of the moon must have appeared to their first human visitors. The panorama around me was painted entirely in pastel shades of blue—the sunlight that filtered down to these depths had long ago lost all the other colors of its palette. The ship herself was a slowly collapsing mirage. Appearing whole and sound of body at first glance, closer inspection revealed that little more than an empty shell remained of the great ship. Riddled with holes corroded by the harsh ocean, shafts of sunlight could be seen streaming down into her inards from vast punctures in the hull above, while schools of baitfish darted in and out of ragged openings in her deck plating. The many years of submergence had obviously taken their toll on her. Farther aft, all that remained of her once stately bridge superstructure—the command center of the great vessel, was a broken and twisted pile of steel beams lying in a heap in the sand. Appearing like a huge child's game of pick-up-sticks, the bridge wreckage was occasionally punctuated by more recognizable objects. A sprinkling of portholes with white, blistered glass; an upturned bathtub—perhaps from the Captain's cabin? A short distance away, the ship's forward mast lay prone in the sand beside her. Broken off at the base and partially buried in the sand, it appeared as a huge tree felled by some uncaring lumberjack. The "lumberjack" was Kapitanleutnant Johann Mohr, commander of the German submarine U-124. 12:21 p.m., March 17, 1942: The lookouts on board the German submarine U-124 sight a small vessel 4 miles ahead. Cautious as he approaches the American coast, Johann Mohr orders the boat submerged. Peering through the submarine's periscope as he begins the pursuit, Mohr soon identifies the vessel as a four-masted schooner, 300 tons burden. The small vessel is not worthy of a torpedo, and the increasing seas make an artillery engagement out of the question—he decideds to let the schooner pass unmolested. The previous evening he had sunk the small Honduran steamship Ceiba, and two days prior had made a fiery spectacle of the 7209 ton tanker British Resource 350 miles east of Cape Hatteras. Now that they had arrived on the American "Happy Hunting Ground," there would soon be plenty of targets worthy of his torpedoes—he could afford to spare this small schooner. His boat patroling only 6 miles off the Outer Banks of North Carolina, Mohr did not have to wait long before encountering the heavy coastal traffic he was seeking. Just before 5:00 p.m., three ships suddenly came into view in rapid succession. First to appear was a steamship of about 2000 tons. As they readied the boat for an attack, a 5000 ton tanker along with a second, 3000 ton steamship were sighted. Choosing to go after the tanker first, Mohr closed to within 600 meters of the ship before firing a single torpedo. The crew then waited for the explosion they new must follow. Aboard the American oil tanker Acme, most of the crew had just sat down to dinner when a muffled explosion interupted their meal. The torpedo fired by the U-124 had slammed into the tanker's engine room, killing eleven men instantly. Captain Sigmund Schulz ordered his men to stand by the lifeboats in case it became necessary to abandon ship. A quick survey of the men told the Captain that twelve men were missing—he sent three men below to investigate. In the ship's engine room they found the eleven men that had been killed by the torpedo explosion, along with one survivor, Leo Bojarski, clinging to a floating barrel with both legs broken. Together, they managed to bring the grateful sailor up on deck, rescuing him from the rising water in the ship's hull. Captain Schulz decided that the time had come to abandon the Acme. The men lowered two lifeboats and the twenty survivors made their escape. Ten minutes later they were picked up by the Coast Guard cutter Dione, which transported the men to Norfolk, Virginia. 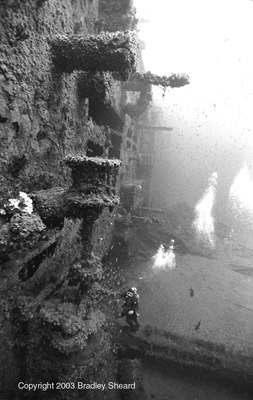 Although the Acme was left left sinking by the stern, she did not sink, and was later taken under tow by a salvage crew and brought to Newport News, Virginia, where she was eventually repaired and returned to service. Back on board the submarine, the attackers watched the tanker settle by the stern through the U-boat's periscope--she appeared to be sinking, and so they left the scene in search of new targets. Mohr was rewarded less than an hour later when the 5106 ton Greek freighter Kassandra Louloudis crossed his path. Remaining submerged, he waited until the freighter, estimated at 3000 tons, approached to within 400 meters of his submarine. Once again Mohr fired a single torpedo and waited for the results (Note: The Captain of the freighter claimed that two torpedoes were fired, one missing and passing directly in front of the ship's bow). While the torpedo was running toward its target, the crew of the submarine was startled by an aircraft passing directly overhead—shortly thereafter the torpedo struck the freighter directly under the smokestack, blowing a gaping hole in her hull. Flying over this scene of destruction, a patrol plane out of Elizabeth City Air Station was a not un-interested bystander to this drama. She had earlier located the torpedoed Acme and stood by until the survivors were picked up. Now she was witness to an actual submarine attack in progress, flying over the Kassandra Louloudi just as the torpedo hit. She immediately turned and dropped depth charges near where the torpedo tracks originated. The depth bombs missed their intended target, however, as U-124 had already withdrawn a safe distance from the Kassandra, watching as she began to list to port. Aboard the Greek freighter, Captain Thamis Millas had ordered an SOS sent shortly after the torpedo had struck. Less than half an hour after the impact, the ship was listing so severely that he was forced to give the abandon ship order, which was accomplished with two of the ship's lifeboats. All 35 crewmen of the freighter remained unharmed, and soon joined the survivors from the Acme on board the Coast Guard cutter Dione, which was guided to their vicinity by the patrol plane. After arriving in Norfolk, Captain Millas told the press that "he was sad to see his vessel go, for he had been through exciting times with her." As evening twilight fell, the marauding U-boat came to the surface to continue her hunt under cover of darkness. She headed southwest, toward Cape Lookout, through rain squalls raging across a choppy, rough sea. The darkness of the night was broken by strong lightning and a glowing ocean trailing behind the U-boat—the ocean was alive with bioluminescent organisms. Despite the weather, the hunt continued. The Standard Oil tanker E.M. Clark was proceding slowly north along the Carolina Outer Banks through an intense electrical storm. Bound for New York from Baton Rouge, Louisiana, she was loaded with 118,725 barrels of heating oil. Brilliant flashes of lightning lit up the entire sky, illuminating the surrounding sea for miles. The tanker was unescorted and proceding independantly—the brilliant lightning made her crew nervous in a sea known to be alive with prowling U-boats. At 12:36 a.m., the Clark was sighted by the lookouts on the conning tower of the U-124mdash;she was a mere 2000 meters away. The U-boat maneuvered northeast to get ahead of her latest target , then turned for a sternshot. At 1:27 a.m. she released a single torpedo at a range of 450 meters. Seconds later, the steel fish ripped into the tanker's hull directly below the bridge. On board the Clark, the explosion broke up a poker game that was keeping some of the crew awake through the early morning hours. Bos'n Harold Rew would later complain that he had been ahead in the game, but had been forced to leave without stopping to pick up his winnings. Knowing full well that if the ship caught fire they were all finished, the crew worked quickly to abandon ship before a second torpedo struck the vessel. But the ship continued to travel forward at very nearly full speed for a few minutes, making it impossible for the crew to launch the lifeboats. Luckily oiler Lawton Williams remained in the engine room just long enough to reverse the ship's engines in order to stop her headway before making his way on deck. The crew then proceeded to lower two of the lifeboats, and 40 of the 41 men on board made their escape. The torpedo explosion had killed one member of the crew as well as demolishing a lifeboat. On board the submarine, Kapitanleutnant Mohr watched his prey sink a little deeper by the bow as she continued to make way. Nine minutes after firing the first torpedo he sent a second on a course toward the tanker. Seconds turned into minutes and still there was no explosion. Finally, after a full seven minutes the commander heard a dull explosion in the distance—he had missed his target and the torpedo had exploded at the end of its run. He prepared a third fish, determined that this shot would finish the ship. By this time Lawton Williams had succeeded in stopping the Clark's forward motion in order to allow the launching of the lifeboats. This action also proved fortunate for the German commander, for it facilitated his objective of sinking the tanker. Closing to within 300 meters of the now stationary target, Mohr fired his third and final shot. Seconds later the torpedo struck the Clark directly under her forward mast. The tanker shuddered under the impact of the powerful explosion; the ship's whistle abrubtly began wailing its characteristic loud and monotonous tone, set off and jammed open by the jolt of the explosion. A fine spray of heating oil, blown high into the air by the blast of the torpedo, now rained down upon the ship's crew. Captain Hubert Hassell realized that the crew had little time left before their floating home would sink. Captain Hassell and Radio Operator Earle Schlarb had been attempting to jerry-rig an emergency radio antenna, as the regular antenna had been destroyed by the first torpedo blast. Captain Hassell calmly decided that there was now no time to complete the job, and ordered the crew to abandon ship. Fourteen men climbed into the number 1 lifeboat and another 26 into the number 4 boat; the number two lifeboat had been destroyed in the attack. Captain Hassell left the ship only after he had taken a head count—sure that all hands were accounted for except utilityman Thomas Larkin, who had been asleep in the hospital room in the vicinity of the first torpedo explosion and was presumed dead, he climbed into the number 1 boat. Struggling against both wind and sea, the two small life boats had just gotten clear of the big hull when a sailor was spotted still aboard the sinking vessel, standing at her rail. Captain Hassell directed his boat to pull half-way back to the tanker, then shouted for the seaman to jump overboard, and he was shortly picked up by the boats occupants. Confident that he was all but invisible in the dark of night, Kapitanleutnant Mohr stood by to watch the Clark settle to her grave. As the bow disappeared beneath the waves, the huge tanker pitched forward, her bow settling on the bottom while her stern reared skyward. There she stood for almost 20 minutes, her stern jutting grotesquely from the sea at a 60 degree angle. As the stern finally began to slip beneath the waves, the ship's whistle, which had been blowing steadily since the second torpedo hit, fell momentarily silent, then began wailing once again in protest as she bade goodbye, capsizing to port and disappearing from view. At dawn on March 18, the alert lookouts on board the U.S. Navy destroyer Dickerson sighted red flares ahead to port. Altering course in order to investigate, they came upon a lone lifeboat containing 14 survivors of the E. M. Clark. The Dickerson took the survivors on board and continued her patrol. That evening the survivors were transferred to a motor lifeboat from Ocracoke Lifeboat Station and taken ashore. The other 26 survivors of the sinking had been picked up by a Venezuelan tanker and were transported to Norfolk, Viriginia. The only life lost was that Thomas J. Larkin, asleep in the hospital room directly above the impact point. war bei Lookout die Tankerschlacht. Hunter's thanks for free hunt! was by Lookout the Tanker fight. To Mohr. Well done. Commander in Chief. Kapitanleutnant Mohr did not survive the war, however. Just one year later, on April 3, 1943, the U-124 was sunk west of Oporto, Portugal, by H.M.S. Black Swan and H.M.S. Stonecrop. There were no survivors.